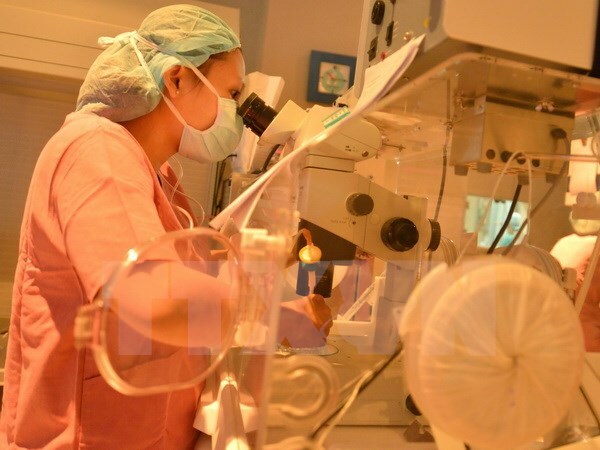 HCM CITY (VNS) — The HCM City-based Tu Du Hospital today announced the first two successful surrogacy cases at the hospital. The first case is a couple from the central province of Khanh Hoa who have been married for four years. The wife, 28, had some shortcomings with her reproductive organs and could not conceive. A 33-year-old cousin of the couple agreed to help them with the surrogacy. The cousin now has an eight-week-old twin pregnancy. The second case is a couple from the central province of Ba Ria-Vung Tau who have been married for seven years. The wife, 31, also had some problems with her cervix. A 27-year-old cousin of the couple agreed to help them, and the pregnancy is now five weeks old. Doctors said that sperm and ovum of the two couples was normal, although they could not conceive by themselves. Dr Tran Ngoc Hai, head of the Planning and General Affairs Ward under the hospital, said that the hospital started surrogacy technology from July this year, but until now the only surrogate mother there was unable to conceive as she had lung disease.